In our last blog post, we touched on how your pantry is one of the most common places that you can find pests in your home. 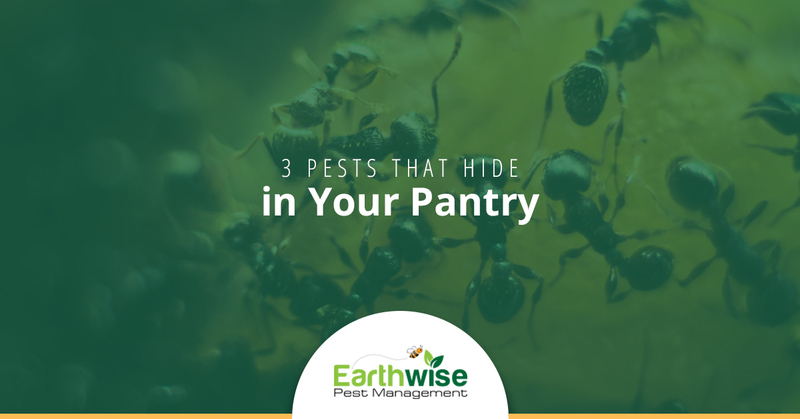 While kitchens are the last place that you really want to find pests within your home, the food sources that are easily accessible in the pantry is what makes them such a desirable space for pests. Now that you know that this is an area of your home that could be harboring pests, it’s good to know what type of pests you should be keeping an eye out for. Keep reading to get an idea of some of the pests that are known for making a home out of your pantry. While Indian meal moths can be a problem before food makes it home, they usually become a problem when food has been purchased and relocated to the home for storage. The reason that these pests are such an unfortunate find in your pantry is because they are known for laying their eggs near food sources. When the eggs hatch, the larvae will make their way into the different food products that they have access to. These pests, prior to maturing, look very similar to caterpillars. They have a very dark head, with the same small legs on the sides of their body. It’s very easy for these pests to be mistaken for maggots when they’re found in food, especially since maggots are commonly found when food has spoiled. One of the major downsides to this pest making its way into your pantry is that they do have the ability to chew. That means that even when you have food items that are packaged, the larvae can still chew through them and make their way to the food. For that reason, if you find an infestation in your pantry, you want to make sure that you remove all of the food that they could have affected. Beetles are another common pest that are found in homes, but more importantly, in pantries. There are two distinct types of flour beetles that you should keep an eye out for, each of them looking a little different but living a very similar life cycle. The easiest way to differentiate the two of them is by looking at their body type. The red flour beetle has a body with three different segments while the confused flour beetle has only one. It’s such a small difference that it can be really challenging to differentiate between the two without looking closely at the pest. The reason that you’ll want to determine what type of beetle you’re dealing with is because it will provide you with some insight as to how the infestation started in the first place. Red beetles are capable of flying while confused beetles are not. This type of information is going to provide insight into how severe the infestation is and the different types of factors that led to the beetle being drawn to your home in the first place. These beetles are small in size, ranging anywhere from ⅛ to ¼ of an inch in size and feeding on grains and dried goods. The larvae are more likely to be found in foods that offer easy access for them and provide them with a food source. Depending on the severity of the infestation and the type of beetle that you’re dealing with, you may need to remove of all the food in your pantry to ensure it doesn’t carry on. A pest that you’re much more likely to recognize will be the common ant. These pests are small in size, but they’re mighty when there’s an infestation of them. Unfortunately, they are small enough that when there is an infestation in your pantry, they can go unnoticed for quite some time. Usually, it is open food that draws them to the pantry in the first place and keeps them coming back for more. Since these pests are so much smaller, it’s not surprising that people think they can tackle them on their own, but the reality is that they can be a challenge to have to try and get rid of on your own. For that reason, we always suggest having a professional come out and tackle your infestation to ensure that they don’t return later on. If you notice that ants continue to return to your pantry for a food source, you may need to look into some new types of storage containers and some additional methods of cleaning. It doesn’t take much for an ant to be drawn to a food source. Something as small as a sticky spot on the counter or crumbs left behind after a meal can be enough for them to survive and build a strong colony. Do your best to clean up, and you can drastically reduce the chances of ever dealing with ants. When you’ve found an infestation in your pantry, you need a reliable pest control company to tackle the task. Earthwise Pest Management is here to provide you with the high-quality care that you need to ensure pests don’t return. If you’re in need of pest control services in your Sacramento home, reach out to our team. We aim to provide high-quality treatments that look at the various factors that attracted the pests there in the first place. Learn more about the safe solutions that we offer and what to expect when working with us.